Four-year-old Oumoh became a symbol of mass migration when the Ivorian toddler was miraculously reunited with her mother after a perilous solo voyage from Africa - but the televised 2017 hug was not the happy ending many had hoped. A year after Italian authorities organised that very public reunion, court officials now say the mother has upped and vanished, leaving Oumoh far from home and alone once more. "The mother ... moved away," Francesco Micela, the president of Palermo's juvenile court in Sicily, told the Thomson Reuters Foundation. The court has opened a procedure to declare Oumoh officially abandoned, a process that could lead to adoption, Micela said, declining to provide further details. Oumoh's story began when she left her home in the West African nation of Ivory Coast and began the long trek to Europe, where she arrived in late 2016 - one of more than 360,000 migrants to cross the Mediterranean for a better life that year. Her mother said she stole her daughter overseas to protect her from female genital mutilation, but said the pair became separated en route after she entrusted the child to a friend. The mother said she went home to collect her belongings - but when she returned, her daughter and friend were gone. More than 43,000 unaccompanied minors have reached Italy since the beginning of 2016, government data shows. Most are from sub-Saharan countries, including Nigeria, Guinea and Gambia, but cases of lone children as young as Oumoh are rare, according to the United Nations children's agency. At the end of 2017, only 116 children under six were living in reception centres in Italy, said Save The Children charity. It is not the first dramatic twist in Oumoh's short life. The toddler was plucked from a rickety boat by Italian coast guard in November 2016 and handed into state care. Days later, she was identified after a girl saw a photo of her while playing with the phone of the head of a migrant reception centre in the southern Italian island of Lampedusa. The lucky break made international headlines, next a relative was tracked down, and months later the mother was flown into Palermo from Tunisia for an emotional reunion. The pair then moved into a community centre that specialised in family reunification until the mother unexpectedly quit and left her child behind. Her motives and whereabouts are unknown. Typically, when young migrants arrive alone by boat, they have lost one or both parents during the crossing, said Antonella Inverno, head of policy at Save the Children in Italy. 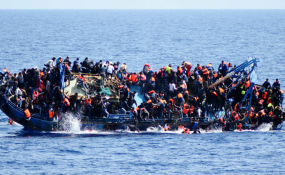 More than 3,000 people died in the Mediterranean over the past two years, according to the U.N. migration agency (IOM). Authorities try to trace relatives and reunite families but "it's not always a happy ending," Inverno said. Mothers often experience abuse on the journey to Europe that can strain relations with any children, she said, while long periods of separation could also affect family ties. Europe's migration crisis, which peaked with the arrival of more than 1 million asylum seekers in 2015, has tapered off, with arrivals falling to the tens of thousands this year. More than 16,000 people, including about 2,500 unaccompanied minors, have reached Italy in 2018, down more than 80 percent from the same periods in 2016 and 2017, Italian data shows.